Dear Rev. Fathers, your blessings! Dear Brothers and Sisters, Thank you for considering this appeal to donate to what with many, I am beginning to realize is arguably, the most important Orthodox non-profit in N. America, Share The Faith Ministries’ Orthodox Missionary Priest (OMP) fund for this continent. Would you allow me to tell you but one reason why? In addition to its goal of some day and only by (y)our support, becoming a multi-million dollar endowment to spread the light of Christ and His saints in places throughout the United States, Mexico and Canada that do not have enough committed Orthodox Christians to provide foundational seed monies for outreach in these places, STF is committed to helping our sacred 100 year-old community and temple of St. George in Michigan City, IN. 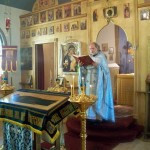 As one of the most historic and blessed parishes in the United States with a rich history that includes three visits from St. Raphael of Brooklyn (see http://www.facebook.com/pages/St-George-Orthodox-Church/119011631528560) and used to hold 125 faithful when services were antiphonally sung in Arabic and Greek, St. George’s today reaches out almost exclusively in English with traditional and uplifting Znamenny, Byzantine and other beautiful Church Chant. Visitors to and residents in our multi-cultural neighborhood can now learn and experience the ancient Orthodox Catholic and Apostolic faith that we have been commissioned by our Lord to share as St. Nektarios says, “with every man” (Iera Katihisis/Sacred Catechism). In this regard, with the blessing of His Grace Bishop Peter ROCOR Diocese of Chicago, Fr. 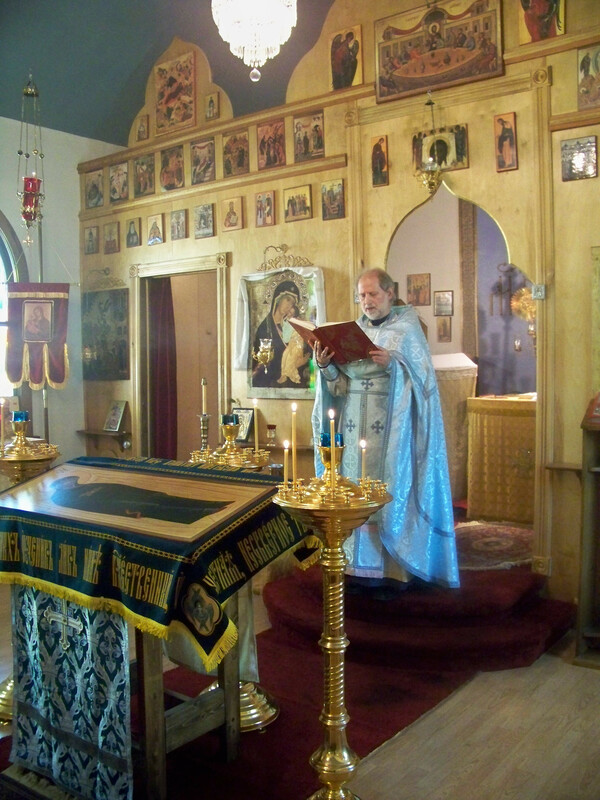 Evangelos Pepps (photo reading the Gospel), has been assigned to serve us on a weekly basis through at least, March so St. George’s may communicate to the general public that we now offer regular Sunday 9:30 am CST Hours and 10am CST Divine Liturgy services. We embrace Father’s auspicious goal for us to in these four months time, triple our small membership and somehow double our meager income. As we for now can with but (#2) pledging members offer only $125 per week — barely enough to cover the cost of his 172 miles of round-trip driving from and back to Kalamazoo, MI – while your gift will not allow our gifted and caring Father to make what some good clergy are fortunate enough to be compensated, should not a man with a family of five to provide for be remunerated more than what is currently not even 3% this amount (click here for Goa remuneration scale)? If you wish to know how appreciative we are of the results Fr. Angelo is helping bring to St. George or any other information, I look forward to hearing from you. Otherwise, as Tom (my brother) and I do our best to build on the foundation of our forefathers who established St George’s and the Pepps’ family gives their best to help us move forward, we humbly appeal to you: Send please, your greatest gift and/or pledge today (link to paypal) so that STF’s transparent board of directors may continue sharing your love for Christ and His saints with suffering man.